It was posted about 20 minutes ago, so naturally you’ve seen it by now. I know by tomorrow it will be old news, but whatever. 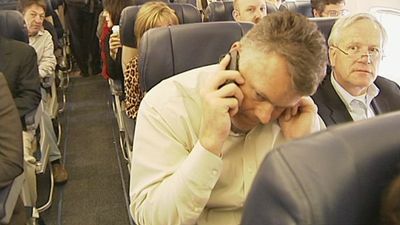 The FCC has proposed that airplane passengers should be able to use their mobile phones midflight, as long as the planes are above 10,000 feet. Now before we go all crazy, it has not happened yet, only been proposed. Also airlines are free to restrict this capability at their discretion. 2) Flying will no longer restrict you from having phone meetings while airborne. Always be closing! 3) You will no longer have to wait 1-2 minutes for your phone to turn on after landing. Unless you are flying an airline that makes you turn it off during takeoff/landing. Then you will have to wait. 3) For a lot of people flights are the last place they can go to have an excuse to unplug. Perhaps submarine rides will be the last tech-free haven? I fly quite frequently, so we will see what kind of effect this has, if it in fact becomes a reality. Honestly I think it’s one of those things that’s easy (and fun!) to complain about before it happens, but will more than likely not be that big of a problem. If it does become super annoying, then I vote we enact SkyLaw to make it acceptable to punch loud, rude people in the face.